I’ve eaten a lot of terrible Halloween candy. This isn’t to say that there’s a lot of terrible Halloween candy out there, but after eating the freshest and the stale-est, I’ve learned what to steer clear of and what to veer into. 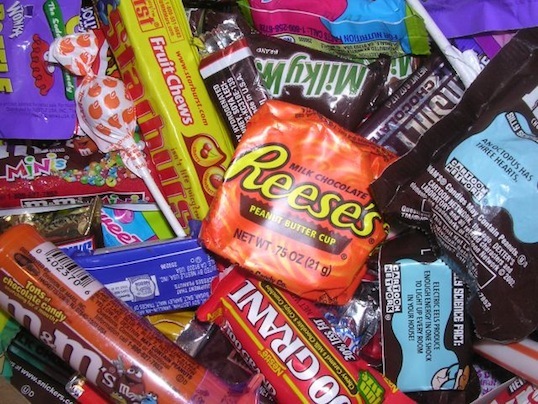 As an adult, I learned that I only had so many calories that I could spend on Halloween treats. This meant that my tastes had to become more selective than they were as a child. To help you navigate this final week of the Halloween Season I’ve put together a handy guide of 4 things to walk away from, and 4 treats to walk away with. I know that everybody gives out Tootsie Rolls. I know that they have very few calories and can last a long time if you chew them slowly enough. But I also know that ff you can get it from a Grandma the other 365 days a year, it also doesn’t really count as “Halloween Candy.” The Tootsie Roll never satisfies, it’s Halloween fools Gold. Double Bubble may be the worst Bubble Gum in the history of chewing, and I’m including that 5 year-old piece of Bazooka Joe that you found under the couch back in Middle School. After 25 seconds of insanely sugary intensity the Double Bubble becomes a rock-hard hunk of something that tastes more like a piece Silly Putty than you want to believe… and yes, I have tasted Silly Putty. I can already feel your rage building, but read on before skipping ahead to the comment section to vent your wrath. I’m not disparaging Candy Corn, or its cousin the Candy Pumpkin. I’m asking you to consider whether or not Candy Corn is hard to come by? Candy Corn is one of the cheapest candies available for bulk purchasing, this means that it’s widely available in dishes and bowls on the counters of offices and meeting rooms nationwide. In addition to this, Candy Corn has an incredibly long shelf life, even when left uncovered in arid conditions. Long after the chocolate and caramel have been consumed or stowed, Candy Corn will be available for you to turn to. Don’t waste your Halloween appetite on something that will still be around until Black Friday. In regards to flavor there is nothing substantial about any of these “candies”; they are simply pure sugar in its loose or caked form. Sugar is supposed to be one of the ingredients, not the only ingredient, in a good Halloween candy. By stripping away almost every other component, these candies are the Halloween equivalent of “crack”- They supply the fix that repeat offenders are looking for without delivering the flavor that the casual indulger requires. Take a Tootsie Pop but don’t open it until you get in the car to drive home, then savor the flavor as you head out onto the open road. The only thing that can ruin a Tootsie Pop is rushing it. If your timing is right, you can bite through the thinning candy shell as you pull into the driveway, dinner appetite still intact. The one exception is the Brown Tootsie Pop, leave that one behind for the real “suckers”. Is it possible for the people at Reese’s to sell jars of their peanut butter filling? Wouldn’t you put it on everything? Whether it be the regular cups in the single, double, or quad packaging, or the Peanut Butter Pumpkin, take the Reese’s and walk away. If you eat it standing there you’ll have at least two more. The Peanut Butter Pumpkin is so good I’ve skipped a meal so that I could have one… or two. Whether someone brings in a bag of Toffee Coated Popcorn or Caramel Popcorn balls, don’t ever overlook the opportunity to eat like you are at a carnival or boardwalk. Remember that if you turn this opportunity down, which you will surely regret around 7P.M. that same evening, your only attempt to scratch this nagging itch will be with a box of store-bought Cracker Jack or Crunch N’ Munch. An adult eating Cracker Jack after 4:30 P.M. is the sign that life has taken a terrible turn for the worse. A funny thing about Caramel Apples is that I’ve never seen one topped in a way that lessened the Caramel Apple’s appeal. Even when an apple has been dipped in chocolate and rolled in pretzels and caviar it still seems to taste great. It’s so hard to ruin a Caramel Apple that I can’t think of any reason to steer clear of them. In fact, since over 80% of this treat is actually really good for you, I’m not sure that you can pass one up and still claim to be a healthy eater! The exception to this is the extremely dangerous “candied apple”, you know the rock hard red ones that always seem to claim a tooth or two. I’m guessing that you have some favorites that I left off of the list, or some wretch-worthy Halloween snacks you’d like to warn the public about. Leave me a response with either or both! Jon, I’ve read your blogs and loved so much you’ve had to say. But you’ve gone too far. You are speaking blasphemy! Leave the brown Tootsie Pops for the “suckers”?! Have you no mind? No taste buds? Hey man, hope you are doing well! I’m just not a big fan of that Brown Tootsie Pop, I guess that I’ll have to start shipping mine to Dar! Couldn’t agree more about the Reese’s pumpkins! Just when I thought the peanut butter cups couldn’t get any better! !